Who knew those delicate, little things we call flowers could cause an avalanche of indecision? With so many options, choosing your wedding flowers can be one of the most difficult decisions you will make on your planning journey. Why you ask? Well, there is the color, the size, the type, the vase, the availability of the flower, the cost of the flower…. the list goes on and on. With that being said, choosing your florals can also be one of the most exciting moments! Having all of the ideas in your mind come to life in color is simply amazing! Here is some food for thought regarding your wedding flowers…. There are a few key questions that you need to answer before you begin your flower journey. 1. What colors do you want? 2. What is your flower budget? and 3. What is the style of your wedding? Keep in mind your venue as you make these decisions. Do you need a lot of color to “dress up” the space, or just a hint? Are you outdoors or indoors? Also, think about the level of formality you are aiming for with your event. The way flowers are arranged are just as important as the flowers themselves. For the budget, keep in mind that on average you’ll spend between 5-15% of your overall wedding budget on flowers. It is one of the larger vendor expenses….and money well spent! “Flowers at their peak are like tomatoes in the summer-priceless and affordable at the same time”. 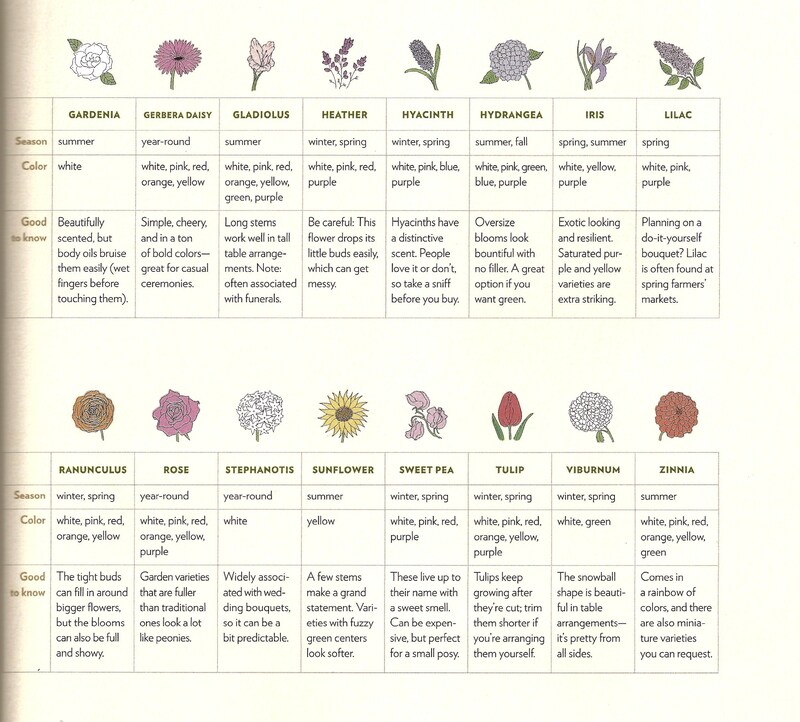 If you choose a flower in your color, during its peak season, you can really get the most flower for your buck. For example, Dahlias are a very popular bouquet flower (and one of my favorites!). These flowers peak in late summer to fall. Can you get them in April? It would be a long shot… and if you could, they’d be quite expensive to get to you. If you are having a spring event, a better choice would be the Peony or the Calla Lily, spring flowers, easy to come by. Tips from me to you…. -Consider “recycling” your arrangements. A very popular option, this allows you to utilize your flowers in more than one location. Do you have a beautiful arrangement framing your ceremony site? Why not have that moved to your sweetheart table? Sparing no expense on your bridesmaids bouquets? Why not have your florist leave empty vases on your head table or cake table for the girls bouquets to double as Reception decor? Hey, they wont need them once you are in the ballroom anyway! Also, be flexible with your design! Consider variations of your arrangement, or a combination of flowers and candles to save some serious cash! -Do your homework ladies! Research flowers you like, tear out the pages of that Ceremony Magazine, and print out pictures in color to show your florist. Have a very candid conversation with him/her about what flowers are most cost-effective at your event time of year and how you can reach your vision without breaking the bank. A good florist will be honest and help with cost cutting ideas, all while giving you ideas to give your flowers the “wow” factor they deserve. Be sure to ask about Taxes that will be due (sometimes aren’t included on your cost estimate!) as well as any set up, rental or tear down fees. -Remember where your guests will spend a majority of their time, what areas will be photographed the most, and then “dress up” accordingly. The ceremony location, reception space, and bouquets are the most important. The cocktail hour decor can be an area of less focus, as guest are only there a short amount of time. Skip those small cocktail hour flowers and add more to your bridal bouquet that will be in all of your photos. It will be worth it, trust me! -Regardless of who you book for your florist, be sure that they are planning to DO A MOCK UP of your design prior to the event for you to view and approve (this should be free of charge!). This is the only way you will really know what your arrangement will look like, in the vase, on the table. What you imagine in your mind may be very different than what your florist will create. A mock-up is vital to your satisfaction with your florals. -And, if you plan on rolling up your sleeves and doing your flowers yourself…. know that this is very time consuming so plan accordingly! Enlist the help of some VERY good friends to assist you on the day of the wedding, as you obviously wont be able to put all the pieces together while you are getting your hair done! If you are taking on this task, keep it simple, and make sure you have plenty of set up time in your event space. 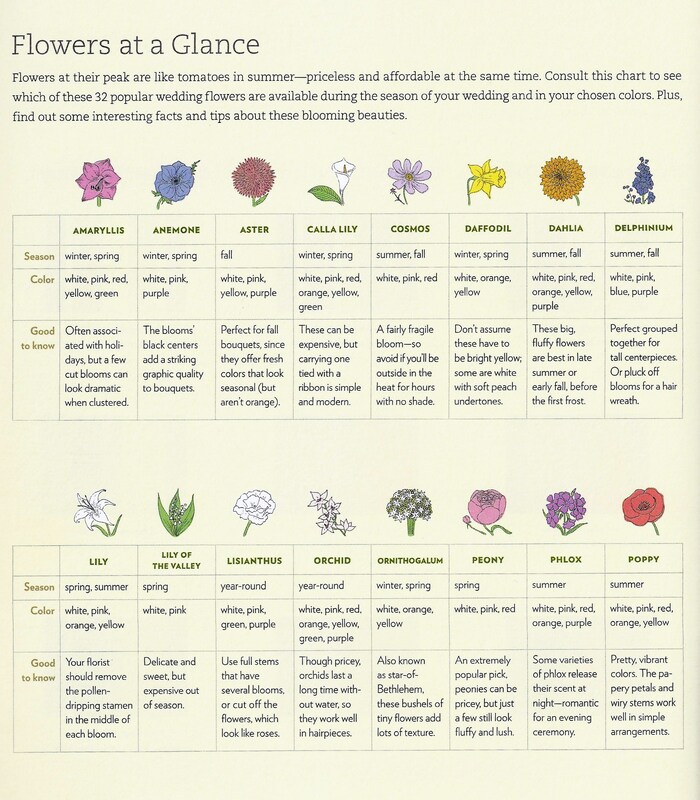 Take a look at a few flower description charts of some of the most popular wedding flowers… the more info. the better!